It’s a key time of year for your grain marketing. Your bins may be full and you’d prefer to sell before spring fieldwork has you completely occupied. It may also be a good time to contract some 2017 bushels. You’re in full gear-up mode transitioning your farm from one crop year to the next. Wouldn’t it be great if there was a simple tool to help price your grain when you’re busy doing other things? And wouldn’t it be even better if that same tool helped you purchase fertilizer if the market hits your price target? Well, there is. ADM Offer Management is an all-in-one grain and fertilizer app. There’s no better time of year to get this tool working on your smartphone or tablet; and you can also access it on your browser. The app is free, and all it takes is downloading it and requesting an account. Growers have been using offers to market their grain for years. ADM Offer Management is a streamlined way to conduct the process, leveraging modern technology. 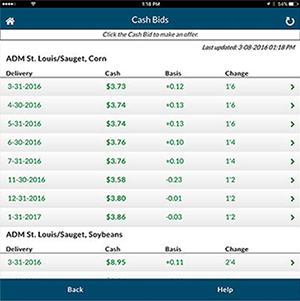 With the Offer Management app, you submit an offer directly to ADM whenever you want. Get notifications by email or text—your choice. Raise or lower your price objectives at any time, and even maintain several offers at once. As a grain marketer, it’s easy to put off decisions. ADM Offer Management prompts you to think early and often about your marketing plans, and then gives you a way to execute. Often grain sales made through a firm offer mechanism end up being some of the better marketing decisions. Why? Because offers are more often the result of objective thought processes—and once made, are removed from the emotion of the markets. Buying fertilizer through the ADM Offer Management app is also handy. Want to see current prices at different locations for your fertilizer needs in season or preseason? There is complete pricing information you access from the app. You can even create your own custom blend and get immediate pricing. You use the same process as you do for making grain offers. The app lets you see prices and place a bid, or you can use the “buy now” feature. Technology is great, but it’s no substitute for good advice. You’re not alone to determine the price goals you establish in ADM Offer Management. If you like, bring your thoughts and ideas to your ADM Merchandiser. It’s the perfect raw material for a conversation. Once you’ve identified your goals, he or she can suggest ideas on how to reach those goals—along with potential risks and rewards. Often, grain sales made through a firm offer mechanism end up being some of a grower’s better marketing decisions. This is a hectic season, but that doesn’t mean you lack the time to make good decisions and get them executed. The ADM Offer Management app helps you establish and stick to plans, along with control and flexibility to change as needed. Just go to the iTunes app store or Google Play to download the free ADM Offer Management app onto one or multiple Apple or Android devices. ADM is providing this communication for informational purposes, and it is not a solicitation or offer to purchase or sell commodities. The recommendations in this communication do not take into account any particular individual’s or company’s objectives or needs, which should be considered before engaging in any commodity transactions based on these recommendations. The sources for the information and recommendations in this communication are believed to be reliable, but ADM does not warrant or guarantee the accuracy of the information or recommendations. ADM or its affiliates may hold or take positions for their own accounts that are different from the positions recommended in this communication. The information and recommendations in this communication are subject to change without notice.